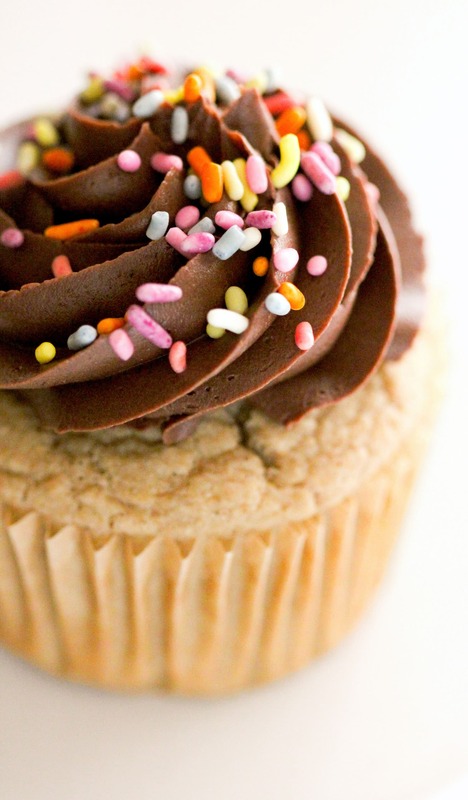 These Gluten Free Vanilla Cupcakes will restore your faith in gluten free baked goods. 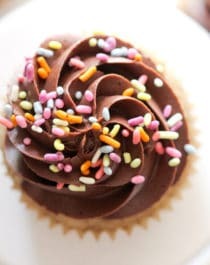 They’re so, so soft and fluffy, they’re moist and won’t crumble between your fingers like sand, and they taste just like all cupcakes should — rich and sweet with comforting tones of vanilla bean in every bite. These aren’t just ANY cupcakes… these are HEALTHY Gluten Free Vanilla Cupcakes! I first posted a recipe for Gluten Free Vanilla Cupcakes back in 2013. While they were decent, I will admit, they were pretty delicate (I was a newbie to gluten free baking back then! ), and the recipe required too many steps and ingredients. Over the years, I always felt like I should revamp the recipe, and finally got down to it last week. When I think of cupcakes, the first thing that pops into my head is a big tray full of the sweetest, cloud-like pillows of fluffy, cakey goodness topped with copious amounts of frosting. Then I immediately flashback to my childhood where I’d pound back cupcake after cupcake, and then when I was in a food-/sugar-coma, ask myself why I felt so sick and uncomfortable. Well, DUH, old Jessica! It was all that white sugar, bleached flour, and artificial flavors! 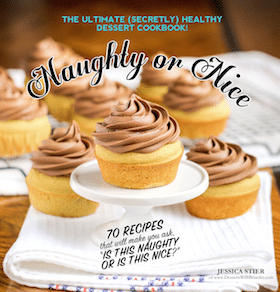 Thankfully, we can say goodbye to all the typical nasty cupcake ingredients and say hello to the healthy ingredients used to make these Healthy Gluten Free Vanilla Cupcakes! The result of these changes? DAMN DELICIOUS Gluten Free Vanilla Cupcakes! They’re sweet, buttery, moist, and fluffy, and packed with vanilla flavor. 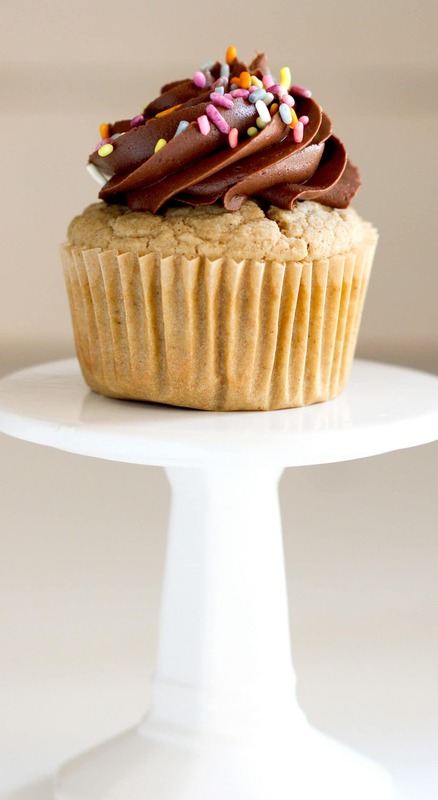 Best of all, you’d never know these are healthy and guilt-free with just 90 calories per cupcake! These gluten-free, sugar-free, and low-fat Vanilla Cupcakes will restore your faith in gluten free baked goods. They're so soft and fluffy and taste just like all cupcakes should -- rich and sweet with comforting tones of vanilla bean in every bite! Preheat the oven to 350 degrees Fahrenheit and line your cupcake pans with 14 parchment paper or silicone liners (or you can spray the tins with cooking spray, but I think these will stick to traditional paper liners). In a small bowl, whisk together the sorghum flour, oat flour, baking powder, baking soda, and salt. In a stand mixer bowl with beater attachment, add the almond milk, applesauce, erythritol, egg whites, vanilla extract, butter flavor, stevia extract, and almond extract. Mix on low speed for about one minute. Turn off the mixer, dump in the dry ingredients, and return to low speed. Increase speed to medium and mix until almost completely smooth. Scrape down the sides of the bowl and mix one last time. Scoop batter into prepared cupcake pans and bake for ~25 minutes, or until the surface of the cupcakes spring back when tapped. Transfer cupcakes to a wire cooling rack and let cool completely. Frost and serve! I frosted my cupcakes with the Chocolate Frosting recipe from my Naughty or Nice Cookbook and added ~1 cup or so of shredded coconut to it. I just eyeballed it. Another good frosting option would be Miss Jones Organic Chocolate or Vanilla Frosting! Can you believe it?? 90-CALORIE CUPCAKES THAT TASTE LIKE 900-CALORIE CUPCAKES! 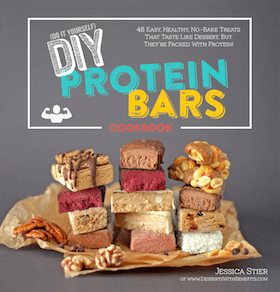 It’s not always about the nutrition label, calorie content, or grams of fat, though… it’s about the quality and nutritional value of the ingredients in the recipe. We should always be able to enjoy dessert without feeling guilty or undergoing a sugar crash. But great recipe! I am going to try this! You’re like a brilliant healthy dessert scientist! I actually just used Soyatoo Rice Whip with homemade sprinkles! I’m guessing the nutritional value is without counting the icing? Still, it’s pretty amazing how you managed to “healthify” the recipe. I’m considering going gluten-free for personal reasons but I always wonder about cake mixes – how do you get the flour ingredients right? 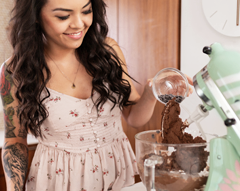 What motivates you to choose brown rice flour, almond meal and quinoa flour? I’m a little confused about baking gluten-free, perhaps you could dedicate a blog post to it? Yes, the nutrition label is for the cupcakes only. And I topped the cupcakes with Soyatoo Rice Whip and homemade sprinkles, which adds very little calories/fat/sugar. As for the flour ingredients, I just based them off the Vegan Cupcakes Take Over the World recipe. In my own recipes, I usually just use GF oat flour and brown rice flour because I feel like that combo tastes a lot like wheat flour in a baked good. Could this be replaced with oil? I prefer to use a fat. Gluten-free cupcakes? Omg, I love you. Thank you so much for sharing the recipe with us!!! I don’t have a lot of experience baking gluten free treats but it’s always great to have a recipe on hand for my gluten free friends!